"Welcome to the church of WWE"
One of the great debates of this modern era is how to define professional wrestling. Is it for real or is it just modern day theatre? Regardless of which side you fall down on in this discussion, it is hard to miss the influence that this has had around the world. Some of the characters from this explosive world of entertainment have risen to the point of being a brand to themselves. None are more recognisable than Dwayne “The Rock” Johnson and with Fighting with the Family he delivers his evangelistic recruitment film for the church of the WWE (World Wrestling Entertainment). Based on the actual events around the rise of one of the Wrestling Divas of the wrestling, the story begins in the home of the Knights in Norwich, England. This was the residence for a family of wrestlers who managed a training gym and organised matches around the country for aspiring and little known wrestling talent. Rick and Julia Knight (played with no holds barred by Nick Frost and Lena Headey) have been training their children for the ring for years and hope for them to get a break in the world of the WWE. 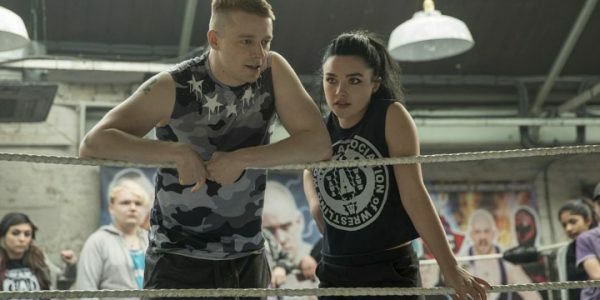 One day that opportunity comes for Zak (Jack Lowden) and Saraya (Florence Pugh) who get the call to try out before a SmackDown taping at The O2 Arena in London. As they come in contact with some of their idols before the tryout including Dwayne Johnson, the pair are confronted with the realities of the industry by the coach and talent scout, Hutch (Vince Vaugh). After going through the gruelling process and showing their talent out on the mat, Saraya is the only one chosen to go on to the wrestling training centre in Florida. As she tries to find her identity and passion for this world of tough competition and fickle fans, the young woman takes the stage name of Paige and attempts to make her mark in the ring. While back in England, Zak must come to terms with being rejected from his dream and the family has to figure out how to support their daughter as she grapples with this new found fame. Even though the producers would want audiences to think that this is for more than the fans of wrestling, the reality is that this is for the fans. Director Stephen Merchant tries to show the human side of those who put everything out on the ring floor, but it really can only be fully appreciated by the die-hard ‘wrastling’ fanbase. What Merchant does bring to the production is brilliant writing that captures the ‘wink, wink, nudge, nudge’ elements of British humour and provides the heart to this underdog tale. The script delivers the balance needed for the culture clash that occurs in the training room by providing a levity amongst the harsh atmosphere of the entertainment industry. The value of the screenplay is even better when put into the masterful hands of Nick Frost and Vince Vaughn who manage to maintain the intensity of their roles while delivering some of the best lines in the film. The primary shortfall for the film is the casting of Florence Pugh as Sarayna (Paige). Despite being a talented actress and holding her own with this strong support cast, she did not truly represent the stature and look of Paige. For anyone who knows the story of the Wrestling Divas, they would know that this female wrestler had the look of all of the other women in wrestling. While in the film the British wrestler mocks the model like stature and intentions of most of the women in wrestling, the realities of Paige's image seems to contradict this theme in the film, but in the end, does not distract from the overall storyline. Despite this little dose of reality, the production team does attempt to throw back the curtain on the WWE and show it for what it really is: An entertainment behemoth. Fighting with the Family proves to be a perfect film for the fans of professional wrestling and for anyone looking for a pile-driving experience at the cinema.